The Authority22 provides the accuracy and consistency competitive bowlers expect…and value that’s been proven on the PBA Pro Tour for years. Here, Brunswick’s Direct+ conditioning system, 39 Accu-ject injectors provide individual board-by-board application, assuring the shot on the lane matches the programmed pattern. With Direct+, conditioner is applied continuously and directly across the entire width of the lane — moving “Z” pattern or secondary application device — providing unmatched lane-to-lane consistency. The soft buffer brush finalizes the taper for smoother pattern transitions. Oil application is controlled by varying the injector pulse rate, not by the speed of the machine. Regulated oil temperature ensures consistent performance regardless of lane variations. Designed to provide outstanding results, the Authority22 delivers serious performance…while remaining seriously easy to use. In fact, your pin chaser can learn the basic operation in less than 30 minutes. 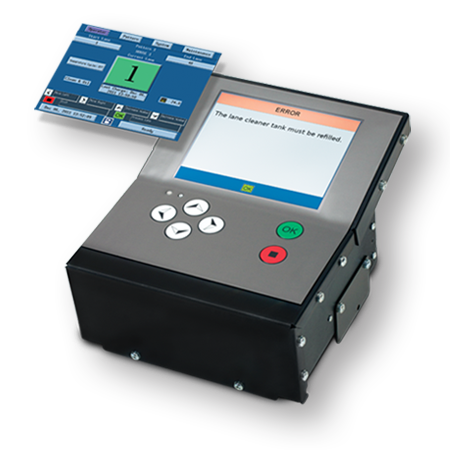 The Authority22 can be pre-programmed to apply up to 10 different patterns on different sets of lanes for different leagues on different days. An additional 50 patterns can be stored in memory. Clearly marked large tanks with wide mouth openings are easy to fill and can prepare 40 lanes without stopping, saving the time of refills. The Authority22 automatically notifies the user when conditioner and cleaner levels are getting low to ensure that the machine isn’t run when dry. Daily maintenance requirements are simple. Just add conditioner and cleaner before use, then clean and wipe down the machine afterwards. 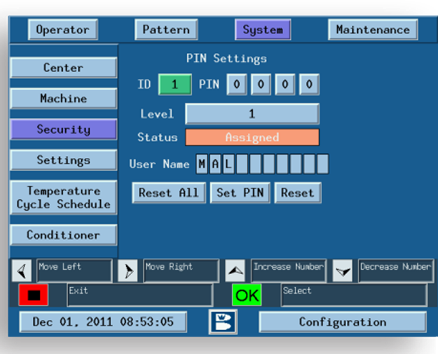 Direct+‘s Graphical User Interface (GUI, pronounced “goo-ey”) means programming is simple and intuitive. 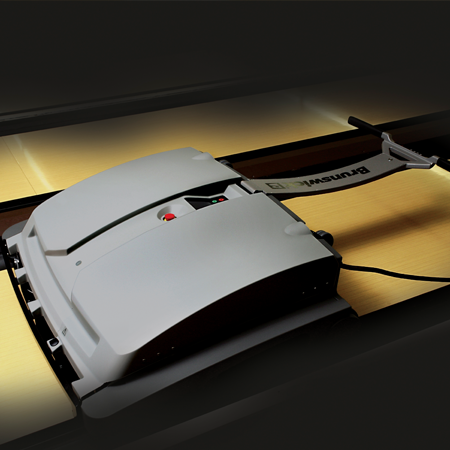 If you host leagues or tournaments, this machine will give your bowlers the shot they want. 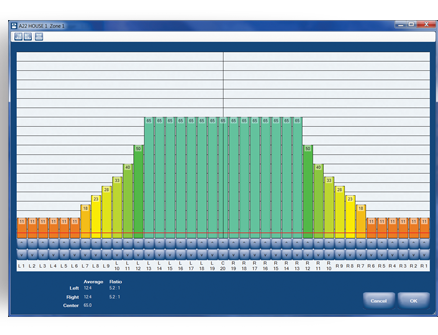 Lane conditioner patterns are programmed in units – the industry standard for monitoring pattern compliance – with zones and oil levels graphically displayed in color. Using this industry standard takes away the guesswork when trying to convert desired units into machine loads and back. When pattern adjustments are needed, it only takes a few seconds to fine tune the units of conditioner on specific boards. For comfort and convenience, navigation through the GUI is controlled by a 6-button keypad below the screen or the 6-button keypad on the T-handle. 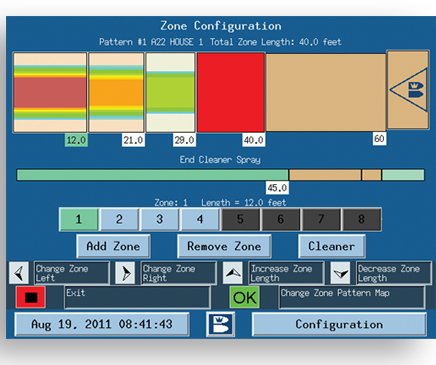 The GUI is easily removed so you can program patterns anywhere without moving the machine from the storage or lane area. 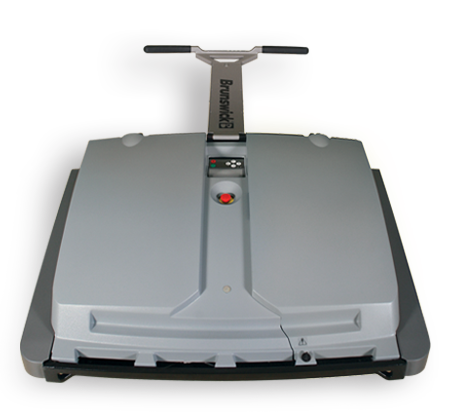 The Authority22 is optimized for quick, hassle-free operation. It takes only about 5 minutes to clean and condition each set of four lanes —- and can complete a 40-lane house in less than an hour! That means more time for your mechanic and pin chaser to tackle other tasks. The Authority22 cleans, dries, and conditions the lane — all on the forward pass. On the return pass, only the buffer brush operates to provide a final, visual smoothing of the pattern. And with its cast aluminum T-handle, large rear wheels, and ball bearing casters, the Authority22 is as easy to maneuver as it is to operate. The Authority22’s Direct+ conditioning system’s conditioner injectors leverage fuel injection technology from Brunswick’s Mercury Marine division. These custom injectors provide precise application on the lane and are designed for over 150 million cycles without a change in output. 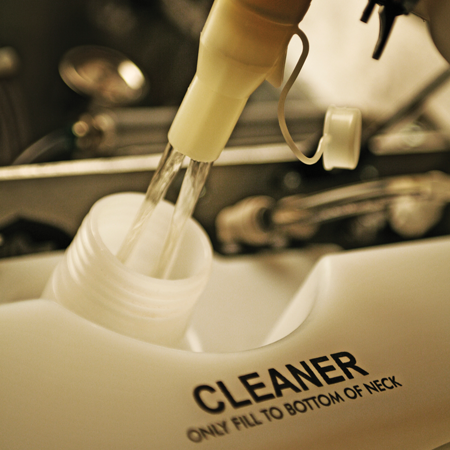 Cleaner application can be customized to match the type and amount of oil on the lane, ensuring complete cleaning while minimizing cleaner use…and the associated costs. The dry duster cloth cleans dust and dirt off the lane before the cleaner is applied. This process uses less cloth and lets the cleaner work on removing the old conditioner. The unique “V” design of the squeegee head guides waste directly to the vacuum inlet for quick, efficient pick-up. During development, Brunswick talked to numerous proprietors and mechanics to understand what they liked —and disliked — about lane machines. Regardless of your position in the center, you’ll appreciate the thought and features built into every Authority22. Multiple levels of security — easily customized — control which functions can be accessed and adjusted by different users, reducing the chance for improper lane preparation. Automated logs track and record the time and user name for all major functions: pattern application, pattern design changes, maintenance messages, and system messages. The absorbent wiper turns and the squeegee blade flips for multiple uses, lowering wear…and your cost. Durable, center-opening fiberglass covers provide unobstructed access to the cleaner, conditioner and recovery tanks, as well as electrical connectors and major internal components, speeding and simplifying service when required. Brunswick backs up the Authority22 with top-notch 24/7/365 support. Field Product Specialists and Internal Customer Response Center engineers provide superior customer service, support, and training for centers worldwide. Need Help choosing a lane machine? Contact us for more information.